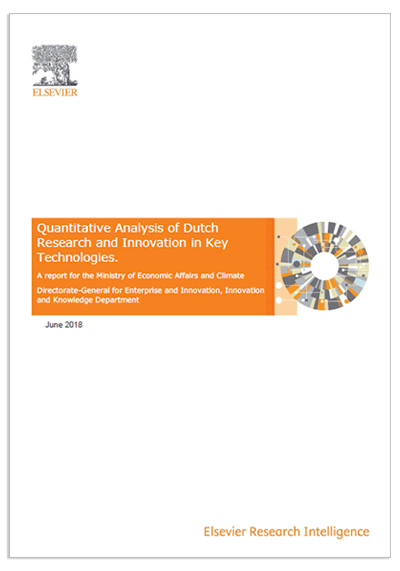 The Dutch Ministry of Economic Affairs and Climate commissioned Elsevier to conduct an objective, bibliometrics-based assessment of The Netherlands’ overall research base which includes all scientific publications across all fields, and across 50 key technologies. The Dutch Ministry of Economic Affairs and Climate, developed the Top Sector policy, to strengthen the international position of the Netherlands as a knowledge economy, to increase Dutch efforts in R&D as a percentage of GDP, and to stimulate consortia for Knowledge and Innovation. The top sectors are characterized by their knowledge intensity, their high orientation towards exports, the importance of sector-specific legislation and regulations, and by their potential to contribute to solving societal issues. These sectors, therefore, offer opportunities to the Dutch business community. This report was commissioned to assess the status of Dutch researchers and research organizations in these top sectors compared to other countries, and which technology areas are the strongest.